I am linking up with Grade Three is the Place for Me for my first Blog Hop! To join the fun answer these questions and link up! If you're just hopping through, check out all the new blogs (see below). Lots to see and read! I am in Richmond, Virginia. I teach first grade in a Title I school. I have been teaching for 16 years - 14 in first grade. I started my blog exactly one month ago today! Remove the word verification from your comment section. It's so hard to read and there really isn't that much spam anyway. Make sure you have a blog button for sharing. If you don't have one - make one! And if you don't know how - google it! There are tons of tutorials. I used one from The 3AM Teacher. And speaking of tutorials, if you don't how to do something you want for your blog, there is probably a tutorial out there somewhere. Find it, try it, and ask another blogger if you need help. The good thing about teacher bloggers is teachers are ever so helpful! I'm off to hop around, read some new blogs and find some new ideas! Thank you! I am already a follower of your blog and I am looking forward to checking out everyone's 'must haves'! I'm your newest follower. I love your blog. Great ideas! Yahoo! Another blogger from Virginia. Your blog is very cute. Thank you for stopping by my blog! I love connecting with other teachers....and picking their brains for ideas...well on just about everything!! You have such a cute blog...and I am now your newest follower!! 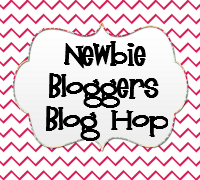 I'm so glad you joined my first blog hop! I used to teach first and LOVE your "magic number"! I love the van de walle book, too. Have you ever used Fosnot's Contexts for Learning Mathematics? They are amazing units!! My firsties and I LOVED them! I'm so glad I found your blog, I LOVE it! Thanks for the great tips and ideas! I'm your newest follower. Thanks for following! I'm glad you found something you can use! Yay! Another Virginia blogger! I love finding others from our beautiful state! So glad I stopped by from the blog hop!